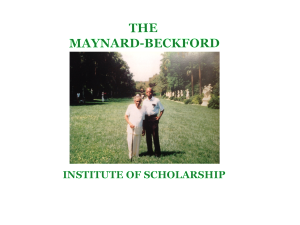 The Maynard-Beckford Institute of Scholarship has as its object the support of scholarship. It will publish original articles of scholarship. Its name reflects the heritage of the “scribe” Vincent H. Beckford and the entrepreneurial educator Delcina D. Maynard-Beckford. These two founded and ran the Maynard Fundamental Institute while alive. This Institute of Scholarship is an homage to them. They are my parents and the parents of my three siblings. The “scribe” Vincent H. Beckford was fond of the song Land of Hope and Glory. The following words are an adaptation of its lyrics.